Nolan made several portraits of bushrangers and of an unmasked Ned Kelly. 'Colonial head' was painted as Nolan drew towards the end of his major Kelly series of 1946-47. The tie may derive from composite police photographs of the outlaw in which his head was collaged to the bodies of others, for identification purposes. However, this painting may be as much about Nolan himself as any bushranger. It has a certain psychological intensity relating to the artist's personal situation at this time. The atmosphere at Heide, where he was living with his patrons John and Sunday Reed, had become emotionally claustrophobic and would end in his permanent departure for Sydney only three months later. Signed and dated l.r. corner, pencil "Nolan 1947". Signed and dated l.l. corner verso on board, red crayon "4.4.47/ nolan". Giles Auty, The Australian Weekend Review , 'Essential Nolan', pg. 13, Sydney, 28 Jun 1997-29 Jun 1997, 13. NOTE: Review of 'Nolan: a Reputation Reassessed' exhibition at Agnews. Michael Feneley, Look , 'From the President', pg. 11, Sydney, Oct 2007, 11. William Packer, Financial times (London) , 'Dark, personal gods and icons', pg. 23, London, 21 Feb 1989, 23. NOTE: Review of Waddington Galleries exhibition. 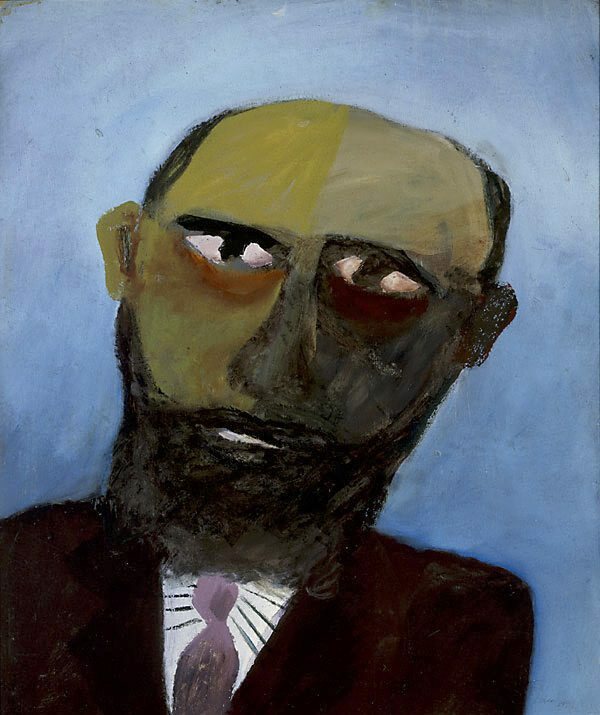 The Ned Kelly Paintings: Nolan at Heide 1946-47 , Melbourne, 1997. NOTE: General information. Portraits of similiar approach. Bronwyn Watson, Look , 'Nolan boost', pg 18-19, Melbourne, Jun 2001, 18, 19 (colour illus.). Art Gallery of New South Wales annual report 2001 [for the year ended 30 June, 2001] , Sydney, 2001, 8, 24, 26.